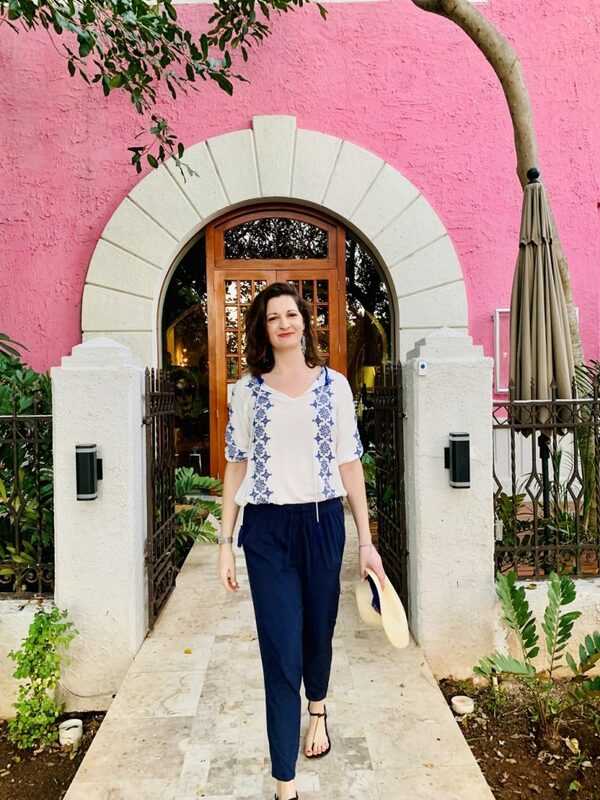 2019 started off with a bang right out of the gate with a trip to the Yucatan capital, Merida, Mexico! Why Merida? To be honest, it was sort of unscientific. I said to my sister, who was going to travel with me, “Let’s do two locations. One on the Riviera Maya and the other could be either Merida or Mexico City.” She thought Merida sounded more manageable for the few days we’d have there, so that’s how we decided on it. 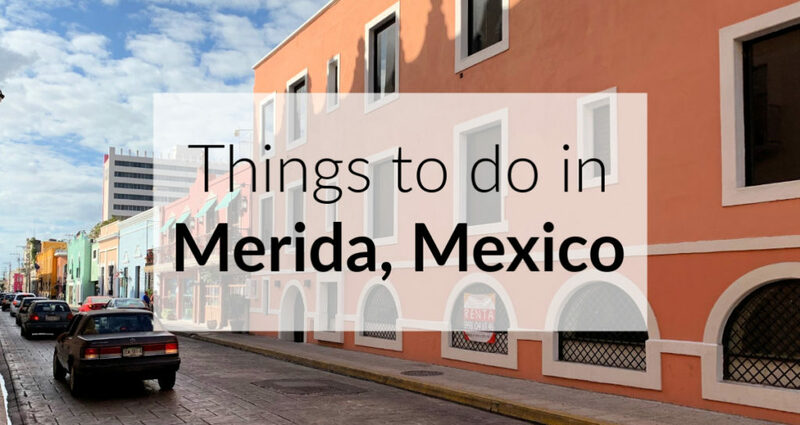 Luckily, there are plenty of things to do in Merida Mexico. We only stayed for a few days (4 full days), but I would definitely consider visiting this charming city again and again. The food, architecture, history, and shopping were all top notch. Merida is easy enough to get to from the Cancun airport, where we flew in, and the city is quite walkable. Mexico City is still on my “to do” list, and I am hoping to get there this fall for Dia de los Muertos, if not sooner. But you’re here for the goods so let’s get to it. 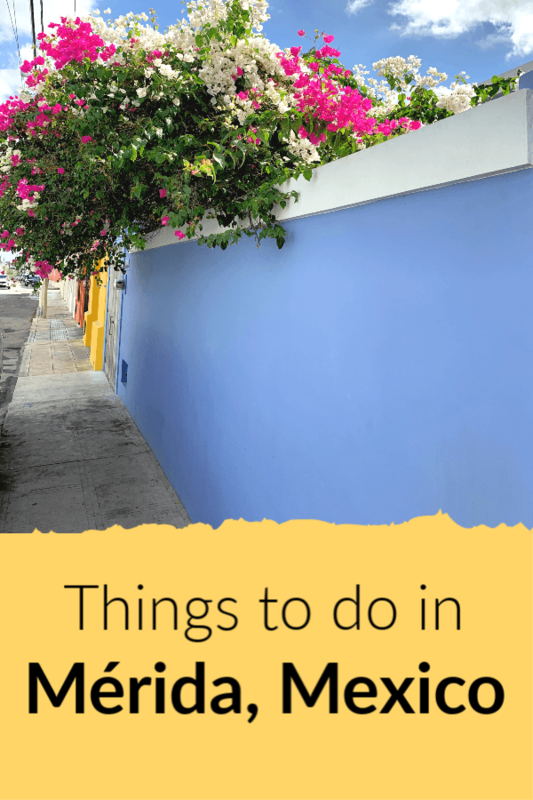 I’ll touch on a bunch of different things to do in Merida Mexico, and include lots of photos from our visit! This site contains affiliate links. If you make a purchase through them, The Roving Fox will receive a small commission at no cost to you. Thanks for your support! How Do You Get To Merida Mexico from Cancun? Merida is the capital city of the Yucatan state, and the largest city in the Yucatan Peninsula. There are 31 states in Mexico, and Merida lies to the north-western part of the state. Merida’s airport, the Manual Conscencio Rejon International Airport MID, is located a few miles outside the city center. There are direct flights to the Merida airport from Mexico City, Houston, Miami, and Belize City. But since we were arriving in Cancun, there are no direct flights to Merida, even though it’s so close! Flight time would have been 8 hours since we would have had a layover in Mexico City and the flight would have been at least $200. So this option wasn’t really meant for us. But if you can lay over in Houston or Miami, it would be super easy to get to Merida. Merida is about a 3.5 hour drive from Cancun. You take the modern highway 180D west and drive on til you get to Merida. The highway is wide and open with minimal traffic. You can rent a car at a number of car rental agencies at the Cancun Airport, and the Enterprise car rental in Cancun has some of the best ratings. Check with your own auto insurance carrier and credit card to see if they cover car rentals and insurance in Mexico. Otherwise, you will pay next to nothing for a car ($5/day), but you’ll get slammed with insurance fees. Make sure you get some pesos (at least $50 USD worth) before taking your car on the highway as there are cash-only tolls. It does seem safe to drive from Cancun to Merida, but we opted to not drive since we’d only need a car once or twice. This is what we ended up doing! The ADO bus is a clean and comfortable passenger bus which seats about 50 people. It also has a restroom aboard. You can see some photos of the ADO bus on my Instagram “Mexico” story. The bus picks up at the various Cancun Airport terminals and drives to the Fiesta Americana in downtown Merida. It costs about 750 pesos ($39) to Merida and 450 pesos ($23) on the return (I can’t say why the price was different, other than we booked the return online). When you exit the international terminal in Cancun, go past all of the car rental agencies, out the sliding doors, and head towards the buses on the right. You’ll see an ADO stand where they sell tickets to Merida, Playa del Carmen, Cancun, and other locations. You can purchase tickets there with cash or credit card. (Cash is fastest). In hindsight, I wish we had booked our ADO tickets online in advance. But we didn’t know if our flights would be delayed and didn’t want to miss a bus and end up paying for a ticket twice. Oh well…next time we will know better! Merida is very walkable and we found that we did not need a car at all. We walked everywhere (gotta get those steps in anyway), and took taxis or Ubers otherwise. We took a taxi twice in Merida Mexico. Both were very clean with nice drivers. One had a meter and one did not. With the one that did not have a meter, we asked how much it would be to our destination before entering the car. I’d always recommend asking before you get in a taxi so you’re not surprised at the end. You can also walk away if the price doesn’t feel right. However, you can also use Uber in Merida, and we did use it to get from our AirBnB to the Fiesta Americana to catch our bus back to Cancun. It is very cheap, and I like that the drivers and routes are tracked by Uber. I’d recommend staying in the center of Merida. This is where you’ll find the most things to do like museums, restaurants, shopping, and more. We stayed at an AirBnb downtown, and it was a perfect place for starting our daily explorations. It was not a super fancy place, but it was $25 per day (including all fees and taxes), and it was a short walk to all of the Merida attractions. –AirBnB options abound in Merida! So many cute places to rent, from a room to a multi-bedroom house. Merida home rentals are so affordable. We did about a half day of shopping in Merida right near the main plaza. It seemed like a lot of vendors matched prices with each other, because all of the stores had nearly identical pricing. Some of the shop owners could be assertive in trying to get us to come into their store, which makes me slightly uncomfortable. Like, if I am stopped and looking at something, I will come in if I want to come in. By them calling to me, it actually just made me want to walk away and avoid a hard sell. Anyone else feel that way? But we did end up buying some really beautiful handmade goods at a store called Mundo Maya. I bought a gorgeous hand-embroidered belt with flowers ($40) I am hoping to wear next year during Day of the Dead. And my sister bought a soft Sisal blanket made from the fibers of the Sisal plant. 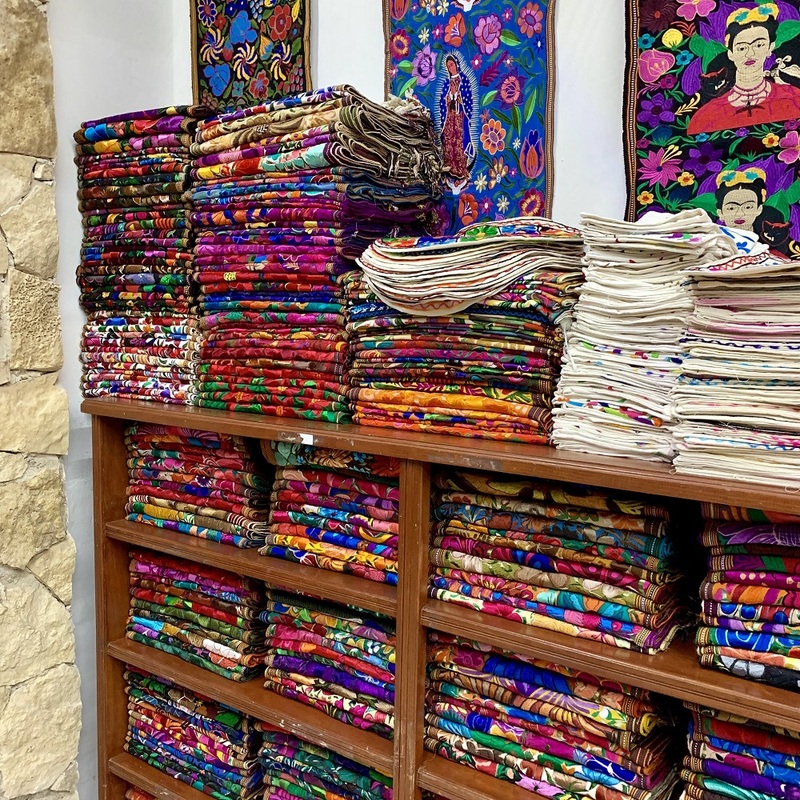 It was also possible to purchase beautiful table coverings, pillow cases, clothing, hammocks, and jewelry in Merida. Perhaps we could have hunted down better prices, but since we were only there for a few days, we just shopped in the downtown. A local also recommended we check out Mercado San Benito, Casa de las artesanías del Mayab, and Mercado Lucas De Galvéz for handmade goods. Unfortunately, we didn’t have the time! The most famous of the Mayan ruins is Chichen Itza, the pre-Hispanic Mayan city dating back to 600 AD. It’s extremely well-preserved, and I’d recommend hiring one of the local guides to walk you through the various parts of the site. If you go to Chichen Itza on a day trip from Merida, pair it with a trip to the charming colonial city of Valladolid and dine at the restaurant located in the Hotel El Mesón del Marqués. Ken and I still talk about the meals we ate their and their fresh-pressed juices. To get from Merida to Chichen Itza you can take an organized tour (check out Viator itineraries, or there are a number of tour companies in downtown Merida who can organize a trip for you). You can also rent a car and drive, and the roads are clean and wide. Check out Expedia for deals on car rentals in Merida Mexico. 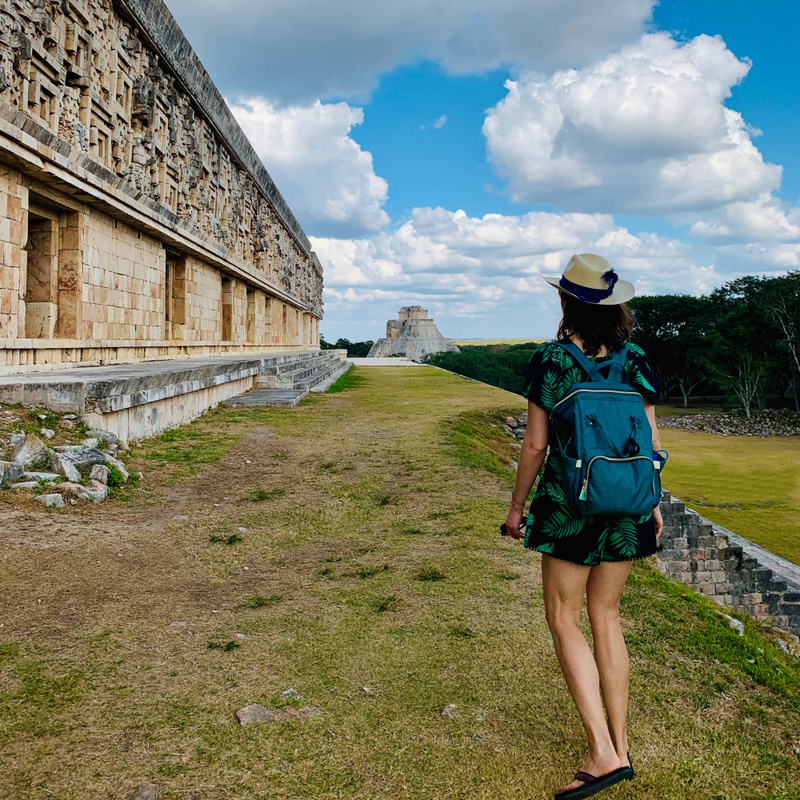 If Chichen Itza is too far away from Merida, try visiting Uxmal! It is one of the most important archaeological sites of Mayan culture, and easy to access on a day trip from Merida. Built around 500 AD, it ruled the area along with Chichen Itza. They were connected by the “sacbe,” or “white road.” It was called the Sacbe because of the light, paved road which connected the two cities. Legend has it that Uxmal’s main structure, the Pyramid of the Magician, was built in one night with the magic of a dwarf. In addition to the pyramid, there’s also a ball-playing game court and several long structures. It’s not expensive to visit Uxmal, just 57 pesos ($3 USD). And you can pair a visit to Uxmal with a tour of Choco Story, a chocolate museum across the street. You can do the self-guided tour of Choco Story, taste their hot chocolate during a demonstration, and stop by the shop to pick up bars of chocolate! A third exquisite archaeological site near Merida is Mayapan. It was founded around 1,000 AD, so it is the “youngest” of these three ruins. If you have energy and a sense of adventure, you can climb the main structure at Mayapan. Pro tip: don’t wear flip flops like I did. I was scared half to death climbing down!! 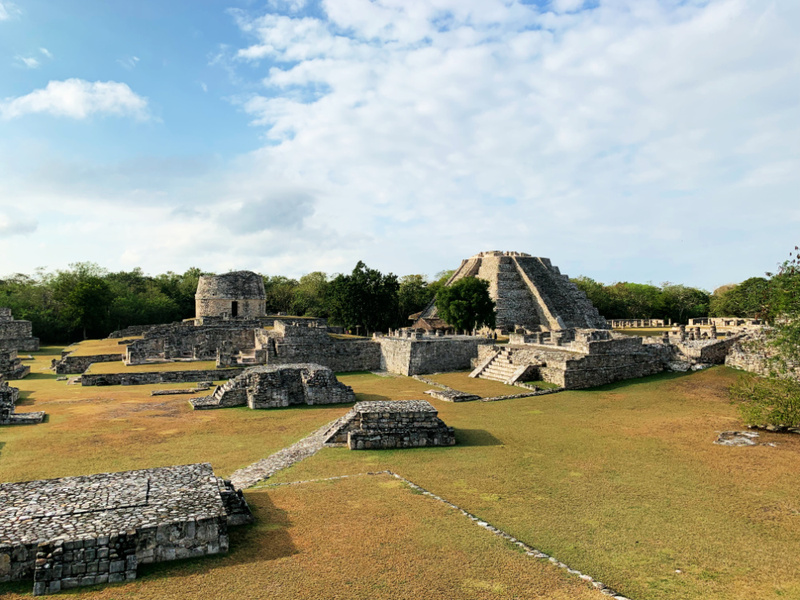 Tours do not go to Maypan, but you can rent a car for the day, or check out this guided tour to Mayapan we did on Airbnb. You go to Mayapan, bike to hidden cenotes, and have a Mayan meal prepared by locals next to the cenotes. I highly recommend it! On the western part of the Yucatan is the Celestun Nature Reserve, a wetland area which is home to flamingos and other wildlife. If you don’t have a car, it would be best to join a day trip out to the reserve, as it takes 90 minutes or so to drive there from Merida. You might have seen photos of a beautiful pink lake with white sand and blue skies. That’s Las Coloradas in Mexico! It’s more north in the Yucatan, and takes about 3 hours in a car from Merida. Again, it’s probably best to rent a car, but there are a few organized tours available if you don’t want to drive. Cenotes are sinkholes filled with fresh and clean water. I’ve heard different versions of what cenotes are, but the most plausible seems to be that they were “bubbles” formed when the asteroid crashed into Earth which killed the dinosaurs. It makes sense because the asteroid hit the Yucatan! 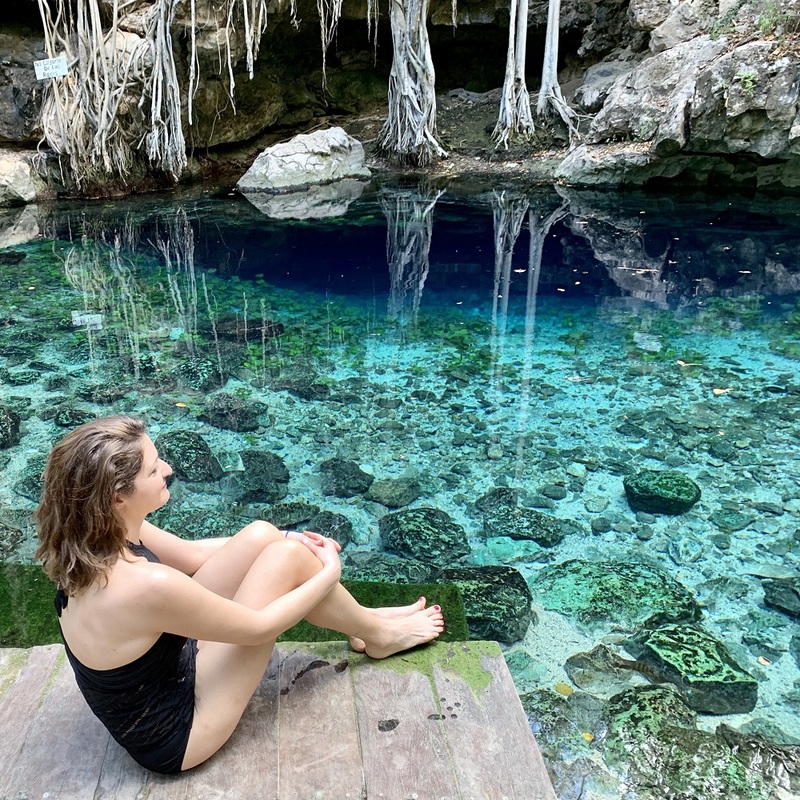 Luckily for us today, the cenotes are filled with gorgeous blue water, perfect for swimming! Cenote Xlacah, which is located near the Museo del Pueblo Maya and the Dzibilchaltun Mayan ruins. Cenote X’batun, which was my favorite cenote for the beautiful blue colors of the water. It’s close to a small group of other cenotes and Uxmal, too, so you can make a great day trip out of that! Cenote Kankirixche has crystal clear water, so you should bring a snorkel to really check it out! The Paseo de Montejo is often compared to the Champs Elysees in Paris and it’s easy to see why. It’s a wide, tree-lined street for cars and pedestrians filled with lovely restaurants, historic houses, and a genteel energy. The houses lining the Paseo de Montejo are the city homes of the hacienda owners, most of which have been restored to their former glory. It’s wonderful to walk down the Paseo de Montejo at sunset and check out the Monumento à la Patria. Every day, the Merida Tourism Office offers a free walking tour. It begins at the Palacio Municipal de Mérida and lasts about 90 minutes. The guides cover the history of Merida and some interesting cultural tidbits. 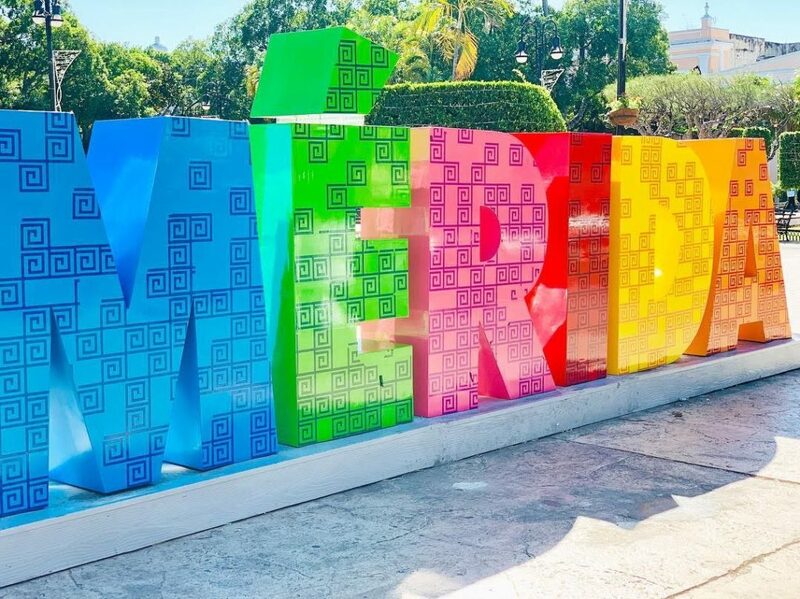 The tour starts and ends right in the main square, so you’re close to the iconic “Merida” brightly colored sign. You have to sign in for the tour so they can keep track of who takes it. You can tip the guide afterwards. As the capital of the Yucatan, Merida is a hotbed for arts and culture! Merida is home to The Yucatan Symphony Orchestra, which performs a full season at the Jose Peon Contreras Theatre, and chamber music concerts. The Jose Peon Contreras Theatre also hosts opera, dance, music, and more at their 1,000 seat venue. Merida is home to both a modern and folkloric dance company, a children’s choir, chamber choir, and state band. Visit the Cultura Yucatan website for more information. The city hosts a number of free outdoor festivals and events, with the most popular being the cultural festivals in early January to celebrate the Epiphany and Merida International Arts Festival. Just be aware that businesses might close early on festival days! 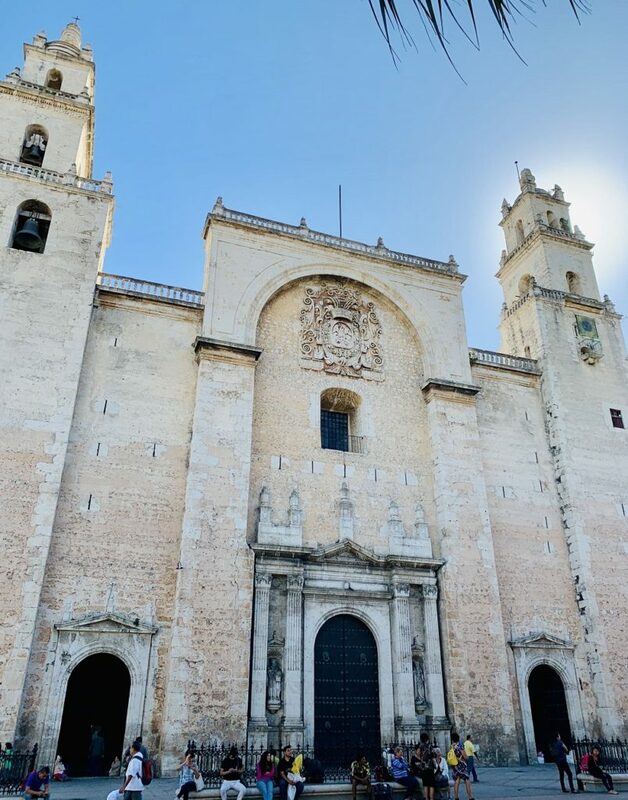 Museum of the City of Merida: This museum features exhibits on the history of Mérida from Mayan times to the present and is located just off the main square of Plaza de la Independencia. It’s also free and has air conditioning for those hot afternoons you need to get out of the sun. Mayan World Museum of Mérida (Gran Museo del Mundo Maya): This gorgeous museum covers the Mayan history of Merida and the local area. It highlights the age of dinosaurs and their extinction, as well as centuries of Mayan culture. It costs $150 pesos for foreigners (about $8 USD) and would be best to take an Uber or taxi to the museum since it’s a little further from downtown. Palacio Cantón, Yucatan Regional Museum of Anthropology: Housed in this converted home of a Mexican General, the Palacio Cantón is now a museum dedicated to anthropology. It’s just $52 pesos ($3 USD) to enter, and is a great way to get lost in the past for a few hours. I don’t know how else to say it…Merida restaurants are sickening. Like, in the RuPaul’s Drag Race sense of “this is so amazing I’m sickened.” It’s a positive thing, I swear, xo. Here are a few of our favorite places to eat in Merida. Our favorite places for breakfast were SOCO Merida for their flaky croissants and strong cappuccinos, and El Barrio for their hospitality and delicious Mexican specialties like Huevos Rancheros. Try the Honey Latte at Bengala Kaffeehaus–it will change you. La Chaya Maya: This place was so yummy we ate here twice. Their menu is bursting with Yucatan specialties, which I learned is different than Mexican food. Definitely try the chaya juice – it is so refreshing, and made from the leaves of the chaya (tree-spinach). We tried the lime soup, panuchos, salads, and a corn tamale filled with chicken. The chaya juice is a must-have! And there is a woman who makes the tortillas by hand in the restaurant, which is really special to watch for a few moments. If you’re looking for a special night out, make a reservation at Rosas y Xocolate. We passed a pleasant few hours dining on their outdoor patio. 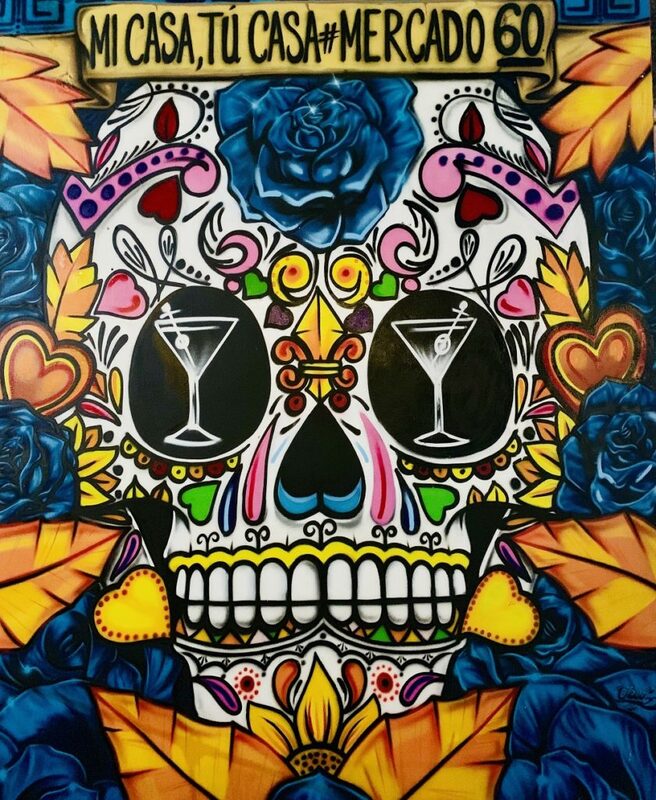 I’d also highly recommend Mercado 60, which is a collection of a dozen or so vendors all selling different foods like tacos, burritos, fresh juices, margaritas, and more. Very cool vibe with lots of young people. Pancho’s was another excellent restaurant and bar, with a large indoor seating area as well as a massive outdoor deck, which was gorgeous. Ki Xokolatl has a shop next to the Santa Lucia Park and prides itself on its organic bean-to-bar chocolate. But we really loved their frozen chocolate drink, which was so refreshing and sweet! POLA Gelato Shop (Santa Lucia) has delicious gelatos in a variety of unique flavors. I tried the strawberry shortcake and the Rosca de reyes, which is a traditional fruit cake served on King’s Day. The gelato had little pieces of cake in it, which was a fun way to try it! La Michoacana: This is a chain of ice cream shops that serves interesting popsicle combinations, ice cream, and fruit drinks all across Mexico. There are five locations in downtown Merida. 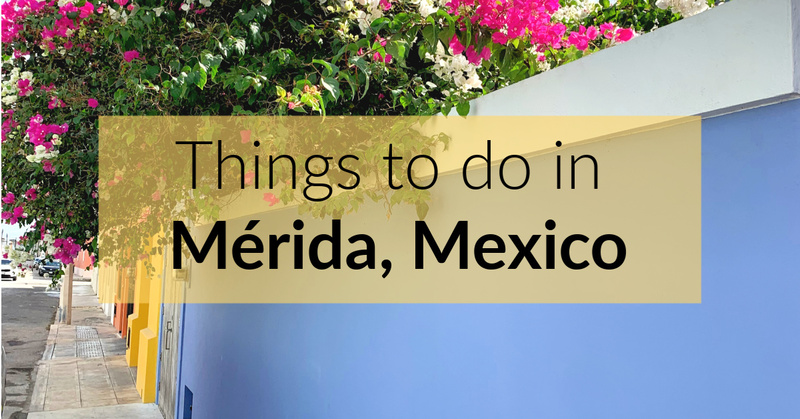 There are fun bars everywhere in Merida, but the ones we kept hearing about were La mezcalería, La negrita, Pipiripau, Mayanpub, and La Pulquerida. Admittedly, we were so exhausted at the end of each day we weren’t able to stay up very late to enjoy them. 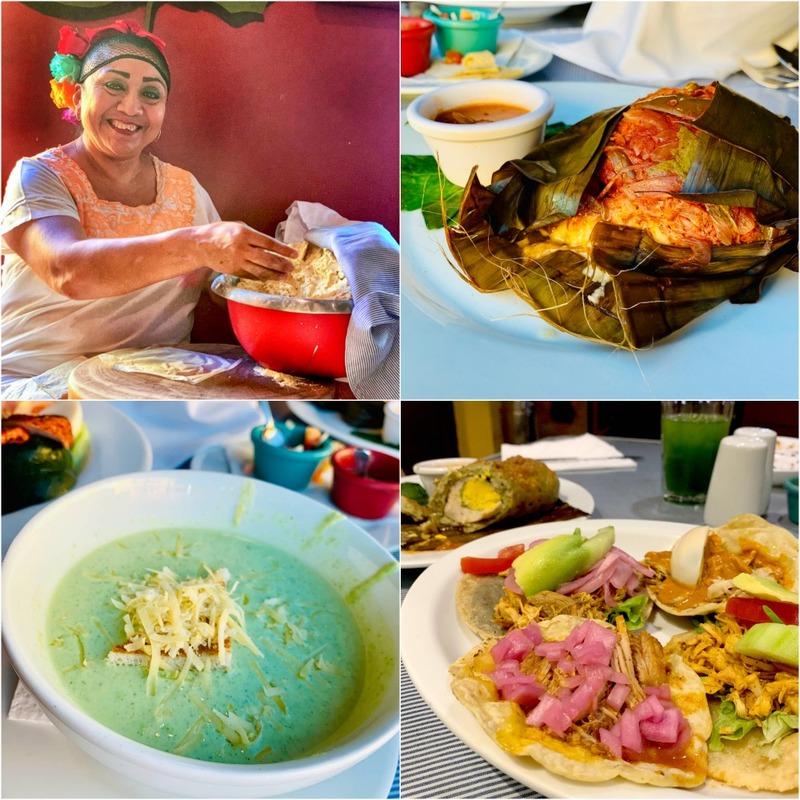 If you’re feeling adventurous, here’s a DIY Merida food tour I curated using all of the restaurants listed above! There are public wifi spots all over Merida! I was surprised and happy with how accessible wifi was in public areas and in cafes and restaurants. I work while traveling, and never had a problem logging on somewhere. Check out my guide for accessing wifi and data while traveling. And read how you can learn Spanish for free (or close to it). Even though we were in Mexico for 10 days total, we were in Merida for just 5 days before we moved on to a Riviera Maya resort which had laundry on site. So I was able to pack for all 10 days in a carry on (which was stuffed to within an inch of its life) and a small backpack. But I’ll list out everything I packed. I feel I slightly over packed, and could have shed a few items, namely dresses. I was pretty proud to fit everything in a carry on and a backpack, though! I didn’t buy many souvenirs, and I did not bring any jewelry. Even in the winter, Mexico can be quite hot and sunny during the day. So you should pack layers, and things that you can wear twice before washing. I’ll link to items below you might find of interest. -I did not bring my tripod and I so wish I did! Please leave a comment below or on Instagram / Facebook if you have more Merida Mexico tips! Or, if this article helped you plan your own trip, I’d love to hear from you. I have not been to Merida yet but it is on my list. I have been to Valladolid and other cities in the Peninsula and enjoyed every single place (and the food). I think I am most interested in visiting Uxmal. Uxmal is amazing! I also love Valladolid. There is so much interesting history and architecture all over Mexico. Wow, what a comprehensive guide! Thank you for sharing. I seriously need to explore more of Mexico! I’d love to visit the ruins and the ceynotes look incredible! Do you know if you can dive near there? I think you can dive in some of the cenotes, yes! I have never been diving, but we snorkeled in all of them. They are so clear all the way down! This is seriously so well written! Love all the details. I haven’t been to Mexico in years but it’s definitely time for me to head back! Thanks, Ashlyn! I love Mexico, too!